Many things in the natural world are geometrically chiral, meaning they cannot be superimposed onto their mirror image. Think hands — right and left hands are mirror images but if you transplanted a right hand onto a left, you’d be in trouble. Certain molecules are chiral, including DNA and amino acids. Light can also be chiral. In chiral light, the direction of oscillation of the electromagnetic wave, known as the polarization, rotates clockwise or counterclockwise. Materials made of chiral molecules reflect light differently depending on the nature of their chirality. The artificial sweetener Aspartame, for example, is chiral. One chirality of the molecule is sweet, the other bitter. Drugs can also be chiral. Perhaps the most infamous example of chirality is the Thalidomide molecule. One version of the molecule acts as a sedative to pregnant women, the other caused terrible birth defects in thousands of children. As a result, being able to observe and analyze the chirality of an object is very important in many fields. However, current chiral imaging techniques to resolve polarization and spectral (color) information require multiple cascading components, leading to bulky and expensive pieces of equipment. Now, researchers at the Harvard John A. Paulson School of Engineering and Applied Sciences (SEAS) have developed an ultra-compact, flat lens that can simultaneously capture both spectral information and the chirality of an object. The research was recently published in Nano Letters. The lens consists of two arrays of titanium oxide nanofins on one glass substrate, as seen below, which forms two images of opposite chirality. 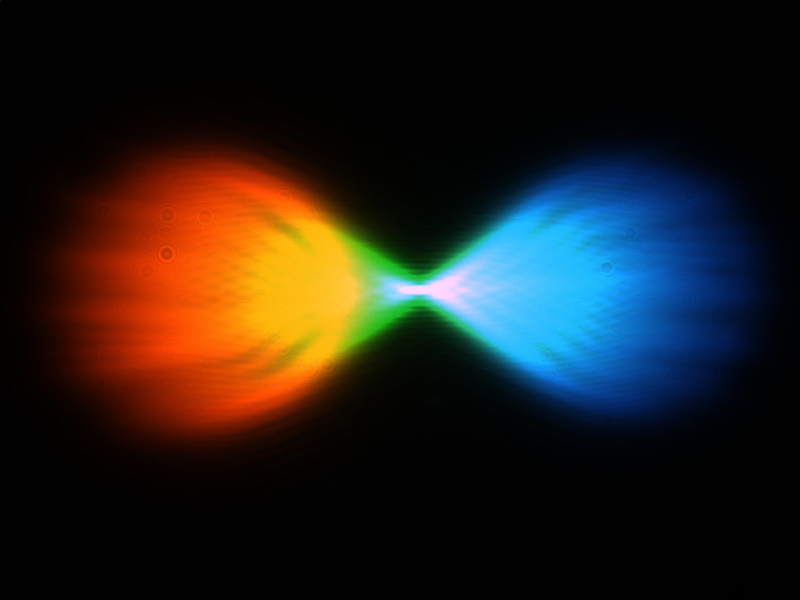 The blue and green nanofins focus right-circularly polarized light and left-circularly polarized light, respectively, and display the images side-by-side. 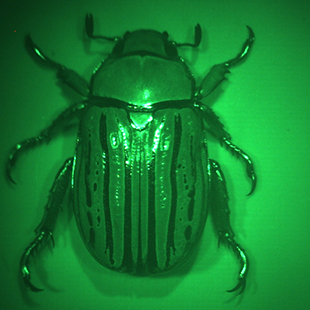 To demonstrate the efficacy of the lens the team imaged the chiral exoskeleton of a beetle. The left image was formed by focusing left-circularly polarized light reflected from the beetle and the right image was formed from right-circularly polarized light. The left-handed chirality of the beetle’s shell can clearly be seen. The lens can also show when an object is not chiral, such as this coin, which reflects left and right circularly polarized light the same. A key feature of the lens is its size, said Wei Ting Chen, a postdoctoral fellow in the Capasso Lab and co-author of the paper. “The chiral lens is very compact, only 3 mm in diameter and thinner than hair, allowing us to integrate it into portable devices,” said Chen. The paper was coauthored by Alexander Zhu, Jaewon Oh, Robert Devlin and David Rousso of SEAS.The research was supported by the Air Force Office of Scientific Research, Thorlabs, and Draper Laboratory. This work was performed in part at Harvard University’s Center for Nanoscale Systems (CNS), a member of the National Nanotechnology Coordinated Infrastructure (NNCI), which is supported by the National Science Foundation. The MCHL forms two images of the beetle, Chrysina gloriosa, on the color camera. 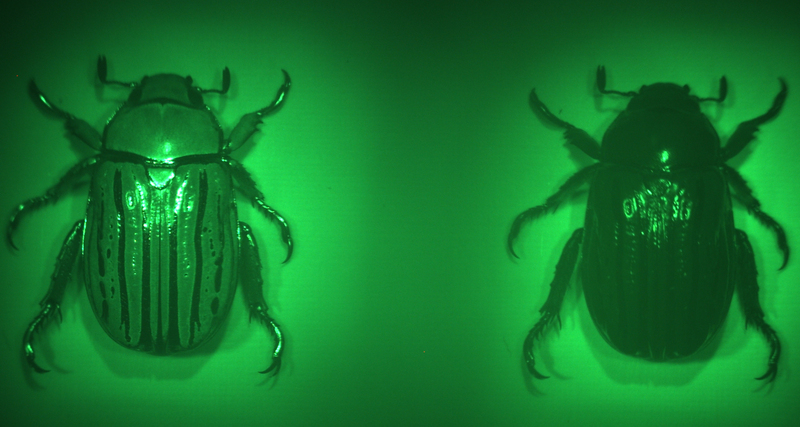 The left image is formed by focusing left-circularly polarized light reflected from the beetle and the right image is from right-circularly polarized light reflected from the beetle. Illumination was provided by green LEDs paired with 10 nm bandpass filter centered at 532 nm.